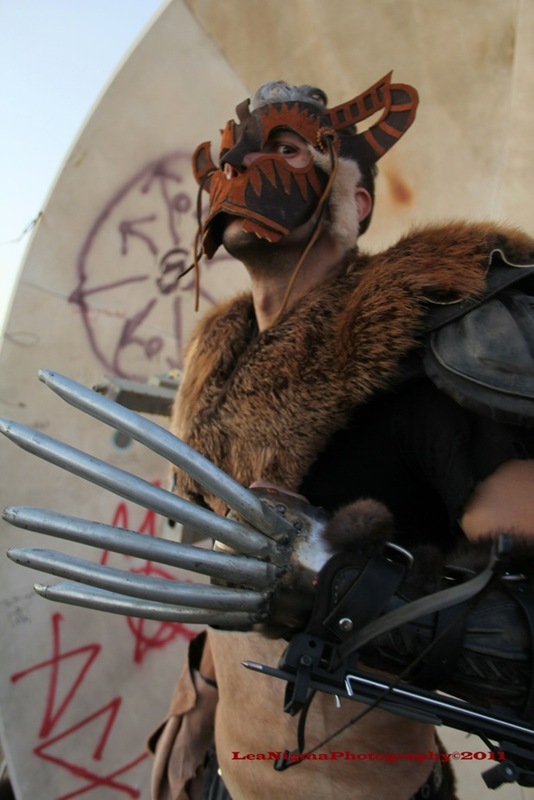 Given that post-apocalyptic outfits are required for all attendees at Wasteland Weekend, costumes are obviously a very important component of the event. 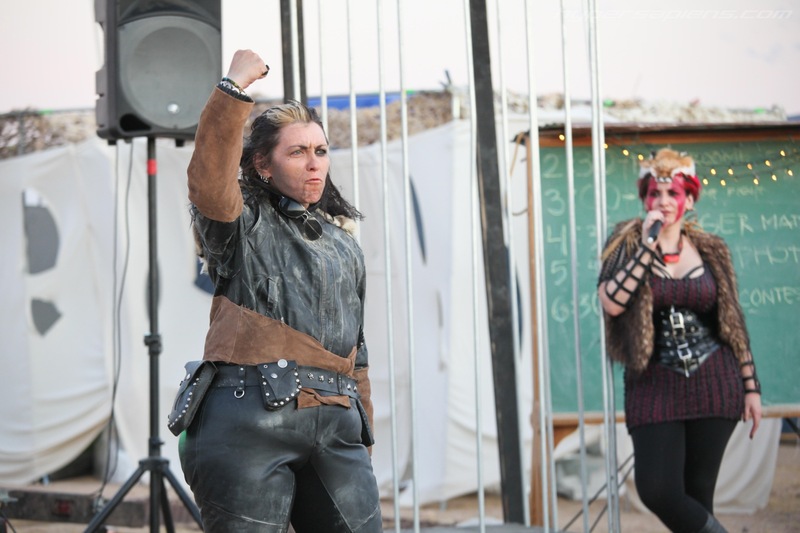 And while it isn’t necessary to wear an elaborate costume to fit in at the event (a wide range of simple outfits can fit the theme) that doesn’t stop many of our attendees from going ALL OUT. 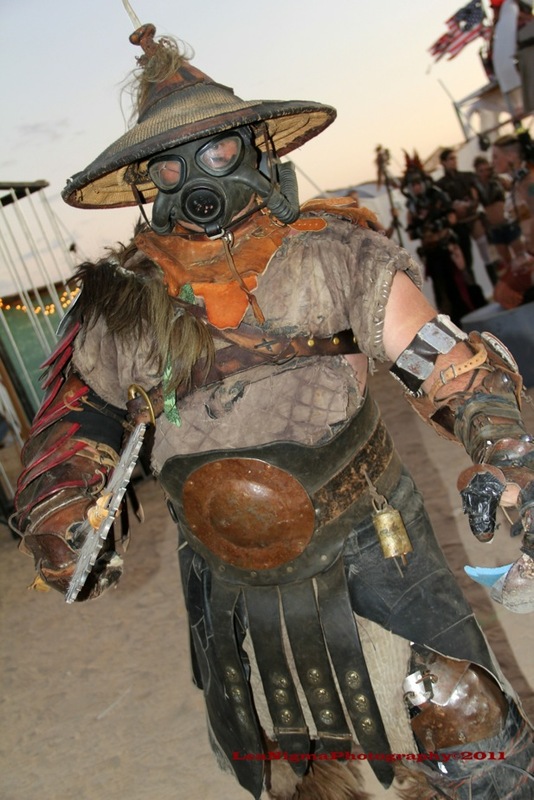 In fact, I don’t think it would be presumptuous to say that Wasteland Weekend is the Super Bowl of post-apocalyptic costuming events. Which brings us to the annual WW costume contest. If you want to win this one, you’d better bring your A game. 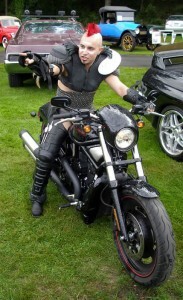 Here is a recap of those who really brought it for the 2011 event. We had two main categories for 2011, split into male and female. We had “original”, which is self-explanatory, and “replica”. Replica meant a costume based on an existing property (a movie, comic book, or video game character). 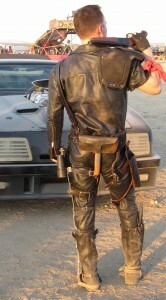 Not surprisingly, Mad Max and Fallout tend to dominate the replica category. The judges for 2011 were myself (Jared), Karol Bartoszynski, Dany, and Rachel. All of us judges have quite a bit of costume experience and we took the judging very seriously. The replica category involved the most scrutiny. After all, it’s a category where accuracy of reproduction is one of the key criterion. Rachel had a hardcover Fallout book ready for reference, and Karol and I are known as the leading experts in Mad Max costumes (hope that doesn’t sound like too much of a brag, it’s not like we have a lot of competition). For both categories, difficulty and originality were taken into consideration. 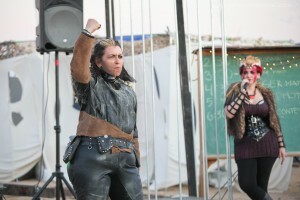 We also factored in whether or not the contestant fabricated or purchased their costume pieces (buying a costume doesn’t disqualify you from the contest, but it is considered in the overall score). 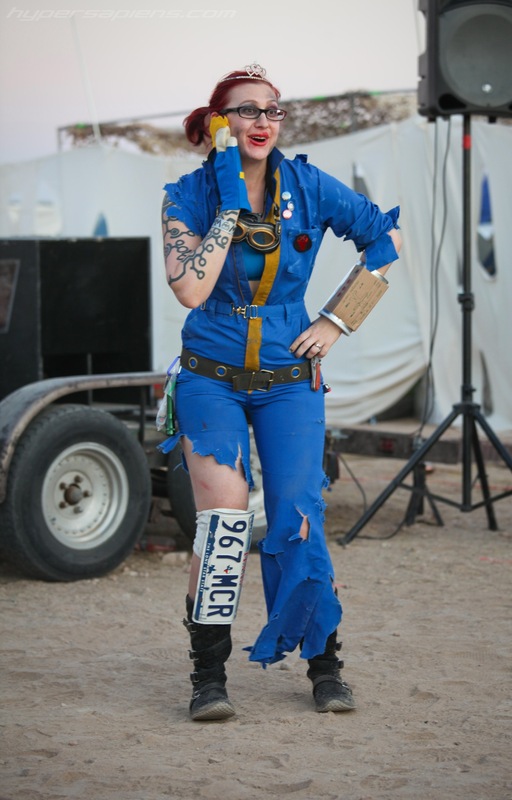 Some of our entrants are real industry pros (we don’t currently have separate amateur and pro categories) and spend a long time and a lot of money getting their Wasteland outfit together. 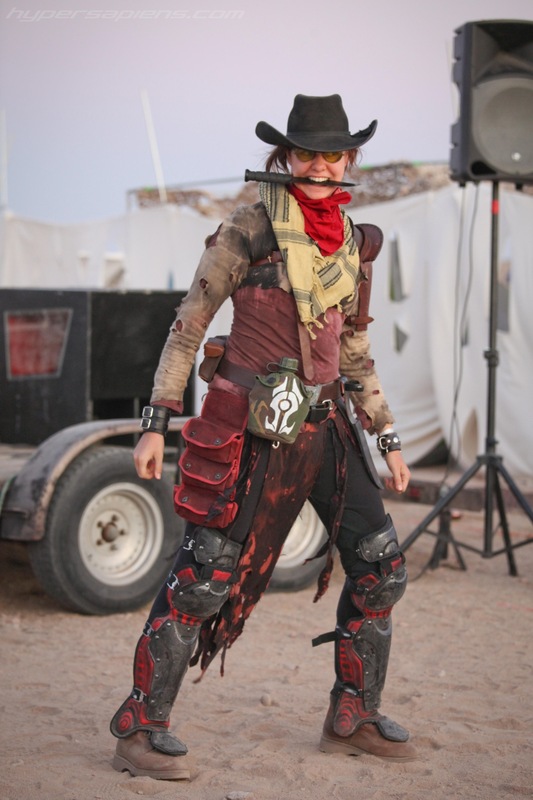 Bottom line, if you win one of the coveted Wasteland costume trophies, you’ve got a lot to be proud of. This was more than just a costume. This was one man’s year long obsession. 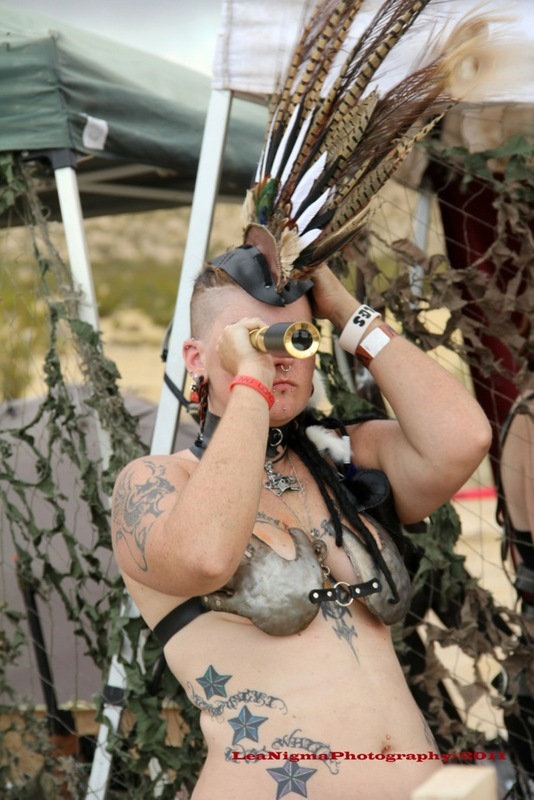 Tank worked out for a year straight and lost something like fifty pounds solely to get his body ready to pull off this costume at WW2011. And yes, we factored that in. But that wasn’t the only factor. This was a VERY accurate representation of the costume from the Road Warrior, down to the custom-distressed leather harness, the boots, the gun, the bald wig with individual hair strands on it, etc.. This was the judges’ easiest decision of the contest. 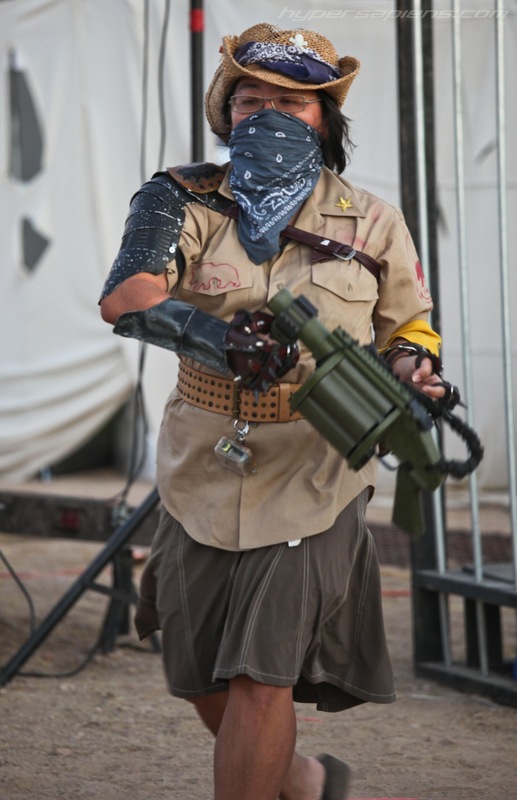 This Fallout-inspired costume was a fan and judge favorite. Robin didn’t just create a great costume, she created a whole character. And while the judges don’t factor performance very heavily into the final score, her wacky dance antics certainly didn’t hurt. 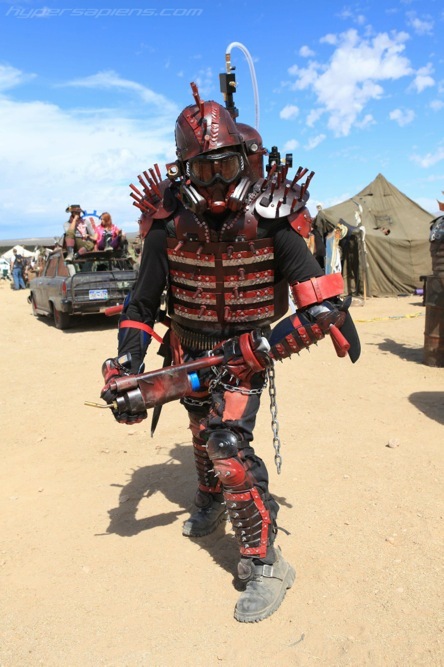 Another Fallout winner, this one include some nice homemade armor. 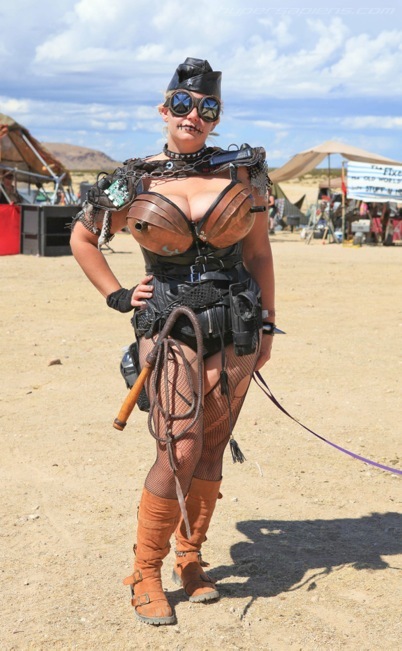 Cross-dressing characters are certainly allowed, and this is the first time we’d seen a female version of the Toecutter from the first Mad Max film. Lea did a nice job with adding some of the little touches (like the eye makeup). This minor character from The Road Warrior (referred to in the script simply as “Bear Claw Biker”) was well represented here, with a homemade version of the tribal mask and the steel “bearclaw” that digs into Max’s shoulder during the film’s climactic chase. Lots of attention to detail with this one. 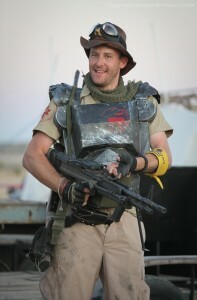 Another nice costume from the Fallout video game franchise. 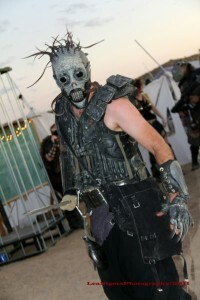 A very striking costume with tribal and animal elements to it. We loved how the long lines of the horns complemented the wearer’s long physique, giving the whole costume a larger-than-life feel. The variety of narrow leather belts around the waist also added a lot of fascinating detail. Once again, all of the components for this outfit were all handmade by the contestant, including the excellent helmet sculpt (complete with sliding removable lenses for the eyes). This design and detail on this outfit were truly inspiring. 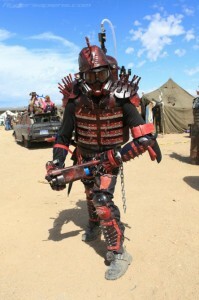 Really nice custom-made black and red armor. And we’ve been told that the flamethrower mounted on his back is fully operational. That didn’t factor into the costume score but was cool nonetheless. 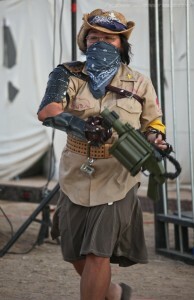 We really liked the apocalyptic practicality and attention to detail of this outfit. With custom gas mask and scavenged/handcrafted pieces reflecting a variety of styles and influences, this multi-layered costume is really a stellar example of post-apocalyptic costuming done right. Thanks to everyone who participated and made our judging so difficult and so much fun. And a special thanks to Humvee Driver, who supplied us with such excellent trophies this year, and to Dee Vyper who created the red plaques for them. We’ve heard that some of you are already hard at work on your costumes for 2012, and we we can’t wait to see what you all have in store for us! Feel free to discuss this post in the official Wasteland forum. Click HERE.